CARIBOU -- Northern Maine Development Commission (NMDC) now has a new tool to help foster economic development and opportunity in northern and eastern Maine. The Commission received notification Tuesday, April 10 that NMDC has been designated as a certified Community Development Financial Institution (CDFI) by the US Department of Treasury. This certification will allow NMDC to expand lending services in Aroostook, Washington, Penobscot and Piscataquis counites. The CDFI Fund was established in 1994 to promote economic revitalization and community development in low-income communities that may be underserved by traditional financial institutions. By certifying qualified institutions, CDFI brings together diverse private and public-sector investors to create economic opportunity. CDFIs now form a robust sector within the larger financial services industry; NMDC joins approximately 1,000 CDFIs operating nationwide. “The CDFI program creates opportunities by providing access to affordable financial products and services for small businesses and provides access to new funding sources such as the US Treasury and many foundations that require CDFI certification prior to investing in the CDFI,” said Robert Clark, NMDC Executive Director. CDFI certification will give NMDC access to other critical financial services available to disadvantaged businesses and low-income communities – supporting projects that will help our region grow. Clark said certification is the first step. “The next steps will be to prepare CDFI and foundation funding applications to build NMDC’s capital base for further investments in small businesses in Aroostook, Washington, Penobscot and Piscataquis counties and to help grow the economy, create new jobs and sustain our business services,” he explained. Becoming a certified CDFI was a component of the recently completed NMDC Next Generation Strategic Plan 2018-2022, which is an organizational strategy developed with broad public, private, and non-profit sector input, staff and board perspectives, as well as critical analysis and application of proven rural community economic development principles. “The key premise of the Next Generation Strategic Plan was and is to generate ‘greater impact’ in the communities and economy through the deployment of NMDC’s resources, being predictive of the future, being innovative with an entrepreneurial mindset and integrating an open systems planning model,” said Clark. NMDC is a nonprofit organization focused on business, community economic development and regional planning programs throughout Aroostook and Washington counties. To learn more about how NMDC can assist your business, visit www.nmdc.org or call 207-493-5851. AROOSTOOK COUNTY — Aroostook County Tourism (ACT) will soon be unveiling its new Aroostook County Regional Guide. Thoughtfully developed narratives as well as a beautiful map showing the region define what The County is about and why. ACT has approached these last two Guide projects with the common goal of celebrating the region’s assets in a manner that conveys a region that folks here proudly call home. Robert Clark, Executive Director of NMDC, added the nearly 2,800 jobs and over $53,240,000 in total earnings as well as $14,700,000 in total taxes in Aroostook County have been generated as a result of the growing tourism industry. Each year, 10,000 copies of the Guide are produced and distributed by mail, online, through official Maine Visitor Information Centers, and at numerous domestic and Canadian travel and trade shows. 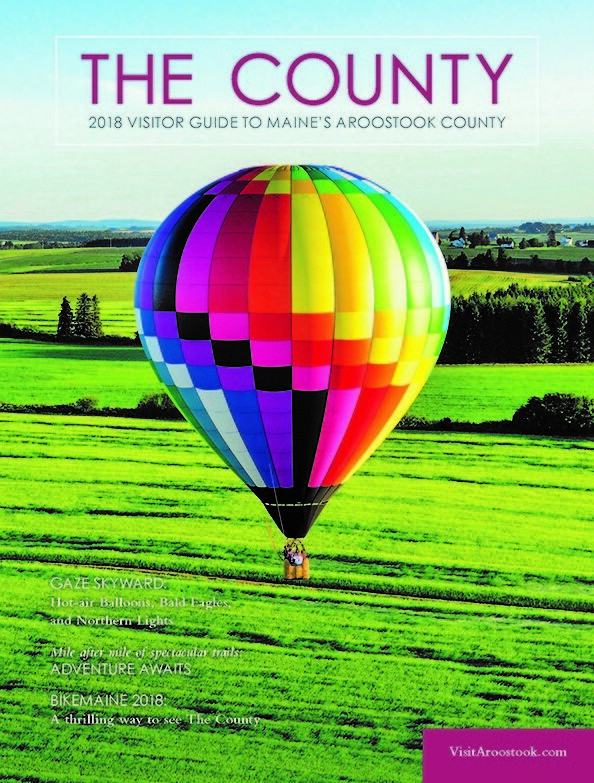 The annually produced Aroostook Visitor Guide is the primary publication used by ACT to attract first-time and returning visitors to the year-round offerings of the entire region. Since 2011, Thalo Blue has designed and produced almost two dozen annual visitor guides for numerous Maine regional tourism entities, including relaunching six of Maine’s eight official regional tourism guides. The firm’s work has garnered high praise, including a Governor’s Conference on Tourism Award for Marketing & Promotion presented by the Maine Office of Tourism for rebranding Maine’s Kennebec Valley. For more information or to obtain copies of the Guide, which should be available in mid-May, contact Judy Dinsmore at (207) 493-5752 or by email at jdinsmore@nmdc.org. AUGUSTA – The U.S. Small Business Administration is pleased to announce that Joshua (Josh) Nadeau, Center Director of the Maine Small Business Development Center at Northern Maine Development Commission, has been selected to receive the U.S. Small Business Administration’s 2018 Small Business Development Center Excellence and Innovation Center of the Year Award for Maine. Nadeau provides no-cost 1 on 1 confidential business advising and counseling services to start-up and existing businesses in Aroostook County, including obtaining financing, developing business plans, marketing assistance, and others. Nadeau was selected for this award because of his outstanding record in exceeding every goal in his job portfolio, including helping to raise $5,030,310 in capital to help Aroostook County businesses. Nadeau was nominated for this award by David Spooner of Northern Maine Development Commission in Caribou. Nadeau will be honored at the 2018 SBA Small Business Awards Celebration on May 1, 2018 at the Harraseeket Inn, 162 Main Street in Freeport. For more information about the event, please contact the Maine District Office’s website www.sba.gov/me or contact William Card at william.card@sba.gov or 207-622-8555. NMDC in April hosted an Erosion and Sediment Control workshop for area contractors, code enforcement officers, and engineers. 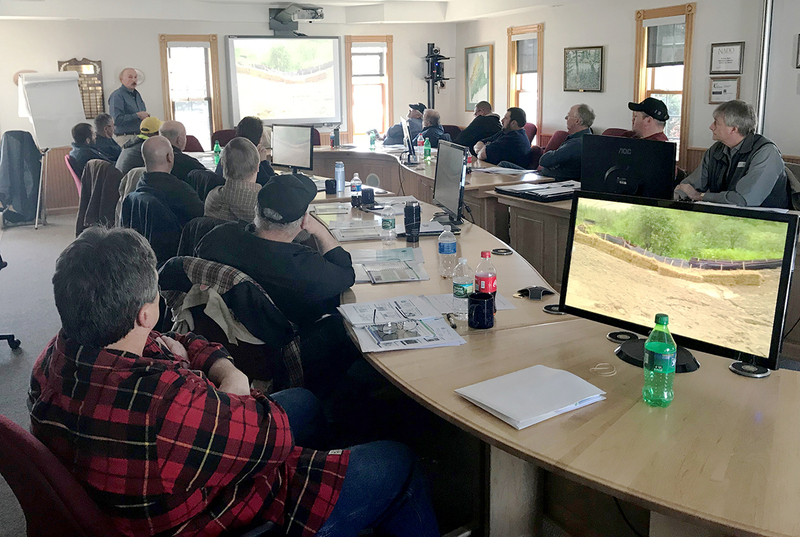 Maine Department of Environmental Protection staff presented which allows contractors to become certified in erosion control practices. William LaFlamme and Scott Belair presented at the day long workshop. AROOSTOOK COUNTY — Nominations have now closed and the judges in the Aroostook Partnership Entrepreneur of the Year competition are now examining the 13 nominees to select the finalists, who will be celebrated at a dinner and awards ceremony Thursday, May 24 at Northern Maine Community College. The finalists, of the Aroostook Partnership sponsored competition, will be honored and a winner announced at an awards dinner Thursday, May 24, at Northern Maine Community College. A panel of judges, representing the supporting organizations of Husson University, Northern Maine Community College, the University of Maine at Fort Kent and the University of Maine at Presque Isle, plus business representatives, will select the top entrepreneur for 2018. The winner will receive a plaque and a check for $1,000. Second and third runners up will receive $500 and $250 respectively. Partnership President and CEO Robert Dorsey said Entrepreneur of the Year is very important for the organization and Aroostook. “It is important to recognize entrepreneurs to encourage people to start or grow their businesses in Aroostook as those actions create jobs and grow our economy and as I’ve said before, small and medium businesses make up a sizable percentage of our economy, so they are very important,” exclaimed Dorsey. Previous winners include David Harbison of Bison Pumps in Houlton, Matt Bell of Northeast Pellets in Ashland, Northern Maine Distilling’s Jessica Jewell and Scott Galbiati (formerly of Houlton), Troy Haney of Haney Building Specialties in Caribou, Corey LaPlante of Northern Prosthetics in Presque Isle, Josh McLaughlin of J. McLaughlin Construction in Houlton, the Buck Family of Mapleton for the Maine Malt House, and Josh Rich of JL Rich Timber Harvesting. The Aroostook Entrepreneur of the Year dinner will feature local produce, products and highlight the cultural diversity of the region. There will also be a vegetarian option. Prior to the meal and program, a social hour with hors d'oeuvres and drinks will be held starting at 5:30 p.m. The price per person is $45. Electronic pre-registration is required by 3 p.m. May 21. The registration link can be found at www.aroostookpartnership.org. For more information, contact Dorsey at 498-9103 or by email at rdorsey@aroostookpartnership.org.